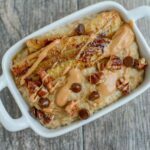 This Instant Pot Oatmeal with Caramelized Bananas is a quick, healthy breakfast option during a busy week and is also perfect for prepping ahead of time and reheating during the week! Add the steel cut oats, milk and water to the Instant Pot and stir to combine. Use the manual button and set for 8 minutes. Meanwhile, cut bananas in half and then slice in half lengthwise. Melt butter over medium-high heat in a skillet. Saute bananas for 1-2 minutes per side until soft and golden brown. Use the quick release method. Stir in peanut butter. Top with bananas and chopped pecans and chocolate chips if desired. It will look pretty liquidy when you take the lid off but will thicken as you stir in the peanut butter and it cools down. I’ve only tried this with all water or 1 cup milk/1.5 cups water. I think it would work with all milk but I haven’t tried it personally. This can be made in advance but will thicken when stored in the fridge. You can reheat it with a splash of milk to get it creamy again. You can also slice the bananas into circles and saute them the same way…it just means more flipping!